We’re having these post-traumatic flashbacks to traveling in Malaysia last February with Mark’s father and brother during Chinese New Year when it seemed as though everything was closed for going on two weeks. 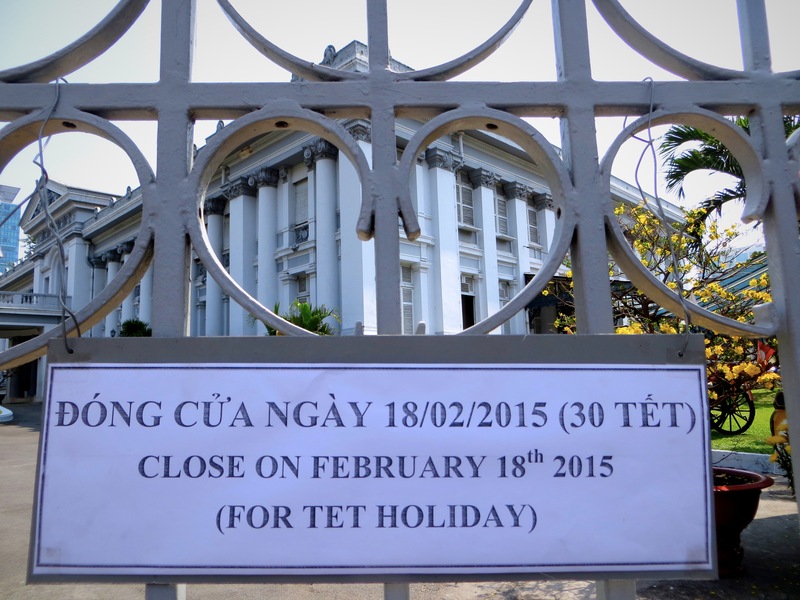 Now here we are in Vietnam just as Tet – the Vietnamese New Year celebration – is getting underway. And it’s apparent they take this holiday seriously. So far, at least, that’s been mostly good. The city is really dressed up and there are lots of happy Vietnamese out celebrating, having fun, dressing up, taking pictures, and just in general being happy. At the same time lots of stuff has been closed, like a well-regarded travel company that we’d hoped to schedule some biking adventures with down in the Mekong delta. For now, though, I’m enjoying the beauty of it all. In fact, we’d planned on only staying three days, but we’ve extended that for another two days just because it’s so cool. Mark & I were here in late 2001 after traveling south from Hanoi over four weeks. Back then I wasn’t impressed with Saigon (technically Ho Chi Minh City, but everyone still calls it Saigon); it was too big and dirty and hot after our beautiful experiences further north. 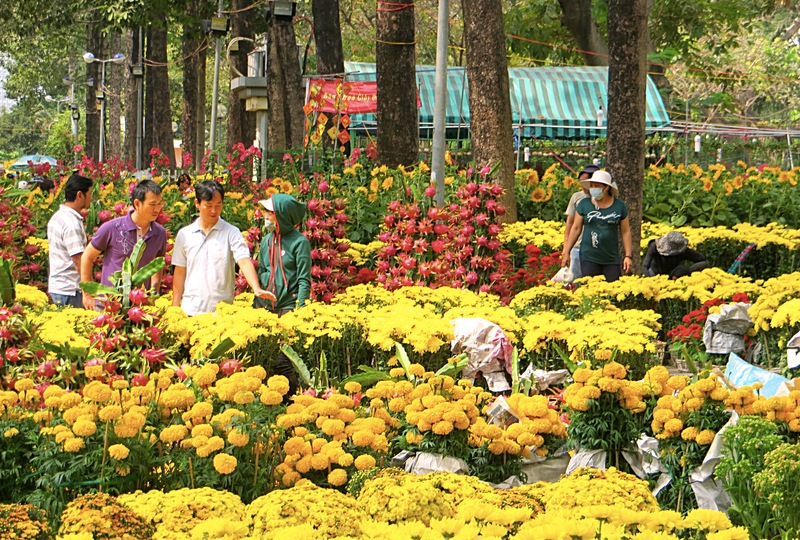 In the worst of situations you get the sense that Saigon can be a beautiful city. But this week, with all the Tet decorations and people dressed up for the holiday, it’s a seriously beautiful city. 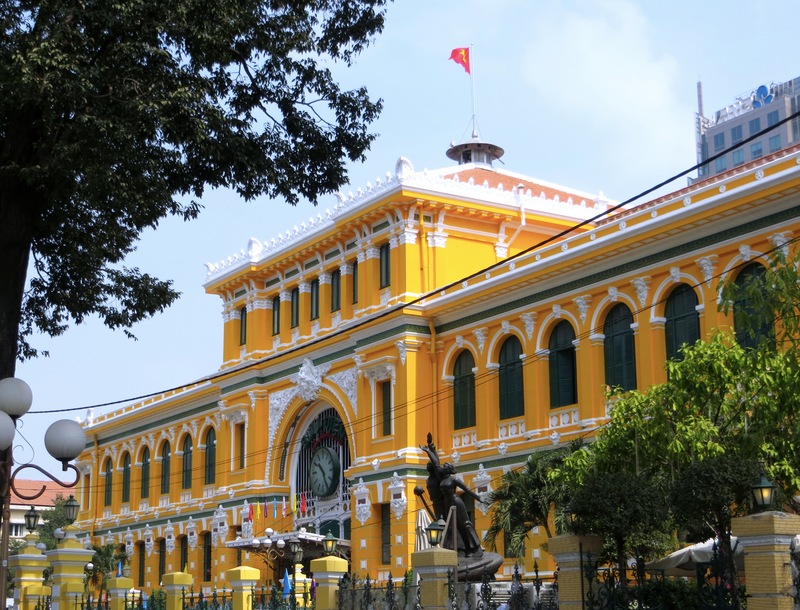 Apparently yellow and red are the colors of Tet, and there are enormous amounts of yellow and red flowers and trees all over the central part of the city where we’re spending our time. 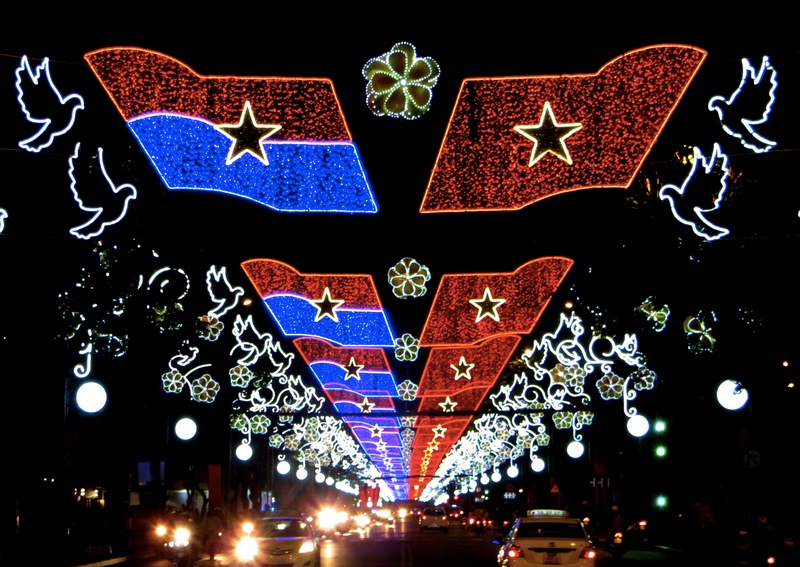 Big, bright light displays over city streets. 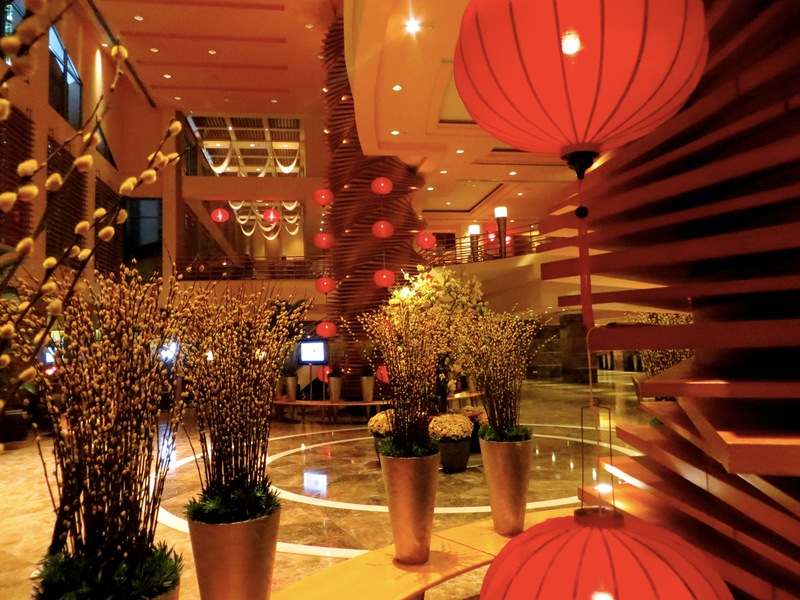 Our hotel lobby all dressed up. Oh yeah, and then there’s all that modern history that just seeps through everything for me. 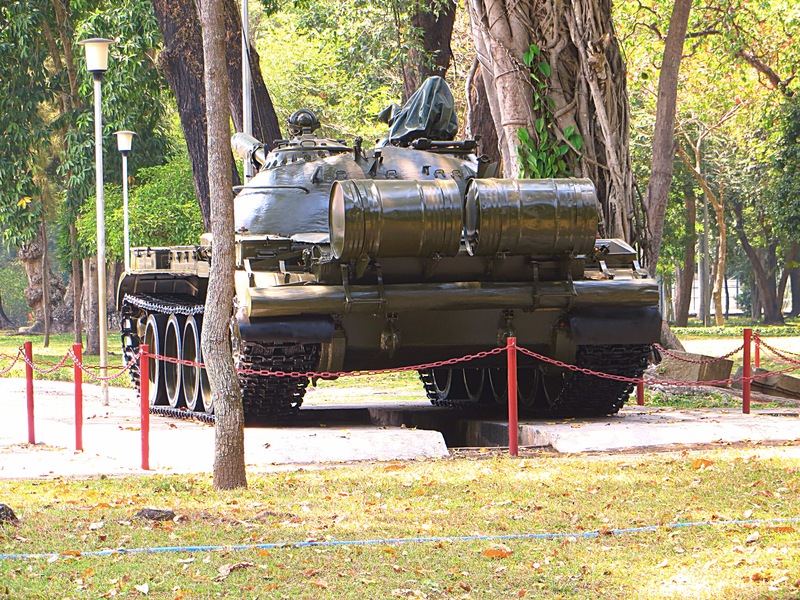 I grew up during the war – I was serving in the Navy over in Naples when Saigon fell – and it’s so strange to think of this as the site of all that history. We’re just a couple blocks from the old Presidential Palace, even closer to the old American embassy. An easy walk to the Continental and Rex Hotels, where Graham Greene and David Halberstam and so many other journalists and officials tried to figure out what the hell was going wrong, and just a couple minutes from the building where that iconic photo of an helicopter taking some of the last Americans away as the troops from the North moved into the city. We’re planning on spending maybe four weeks in Vietnam, and after just three days here I get the sense I’m going to fall in love with it again. Meanwhile here are some of my favorite pictures from our first couple days in Vietnam. All this beauty, and we haven’t even been to the beach yet! 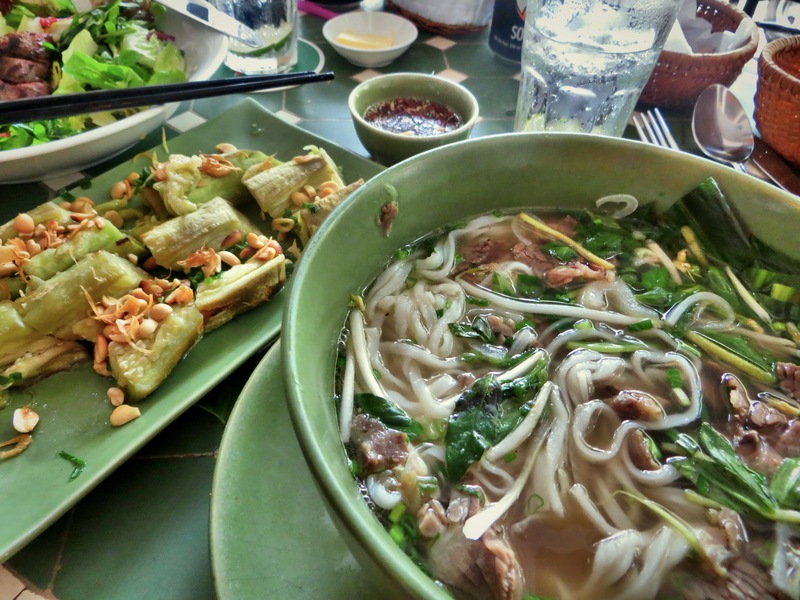 No discussion of Vietnam would be complete without mentioning the fabulous food. This was my first bowl of pho, the ubiquitous noodle soup mixed with Vietnamese herbs and spices and lots of fresh greens. Don’t let those noodles fool you, though; to avoid the carbs we just eat the meet and greens and broth, leaving the noodles in the bowl. The Vietnamese think we’re weird. 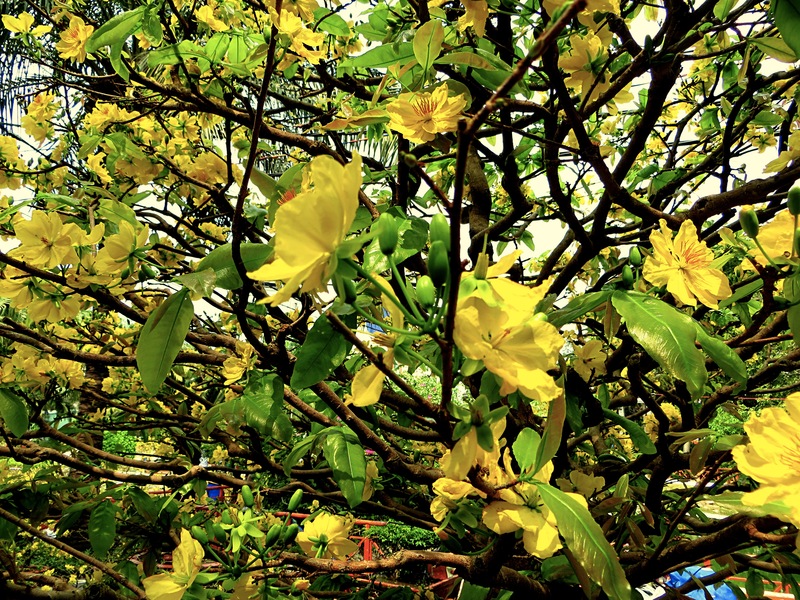 These yellow-blossomed trees are all over the city. We were told that they were apricot trees, but the pictures of apricot blossoms I see online are mostly white and light pink. At any rate, whatever else they are, they are beautiful. How do all those flowers and trees get around the city? 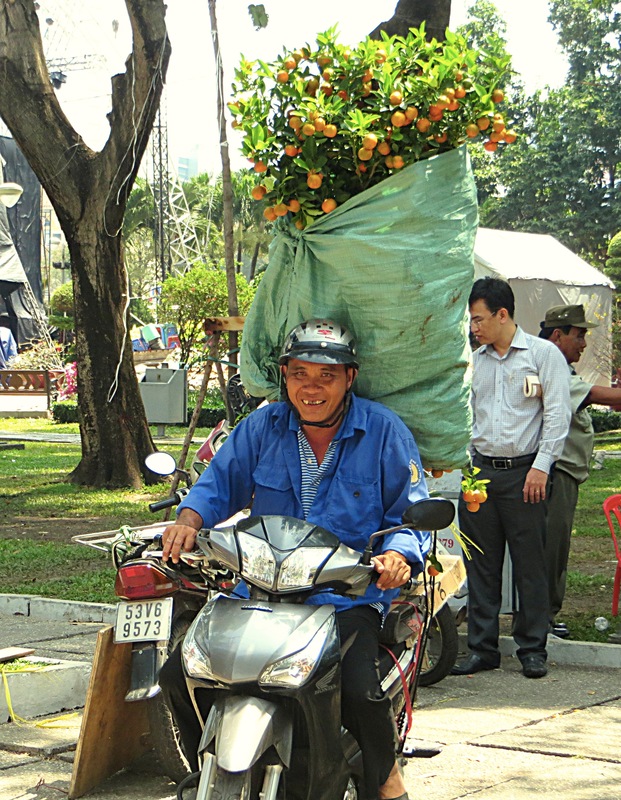 We saw lots of these – guys who’d strapped whole trees onto the back of their bikes – traveling around the city. 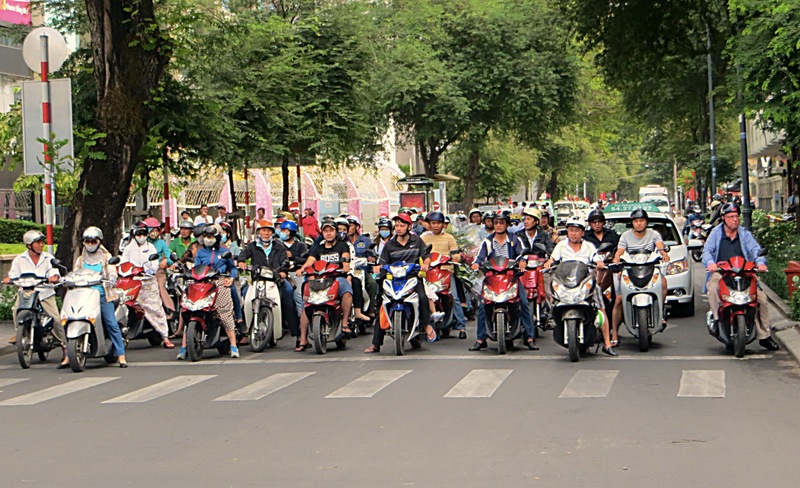 The traffic in Saigon is a story unto itself. It’s actually a lot calmer than many huge Asian cities, but crossing a street can be daunting. In most cases street lights either don’t exist or are largely ignored. Instead you step off the curb and walk deliberately to your destination. The swarm of scooters just flows around you, like a rock in a river. Don’t dart or move too fast, though, ’cause that’s when you get in trouble; just trust that they’ll miss you. 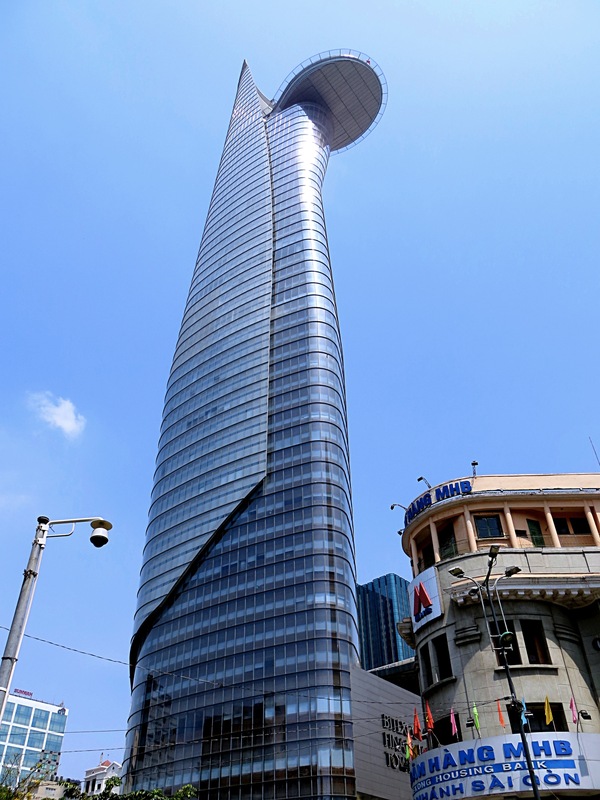 The Bitexco Financial Tower, emblem of the new Saigon. It’s supposed to resemble a lotus flower, but I’m not seeing that. 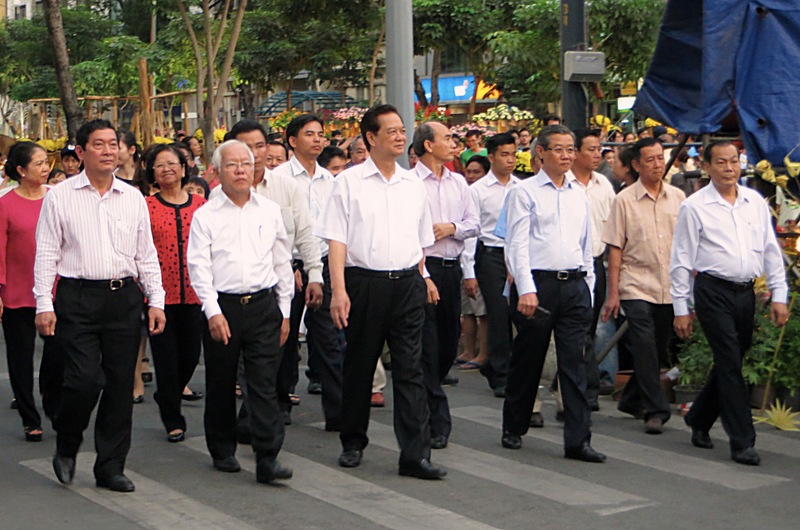 I was out seeing the sights one afternoon and who should be out for a stroll down a street all decorated for Tet but Vietnam’s Prime Minister, Nguyen Tan Dung, a native southerner (in a country ruled by the north). It was a strangely subdued experience; people were taking pictures and all, but it wasn’t that big a deal. 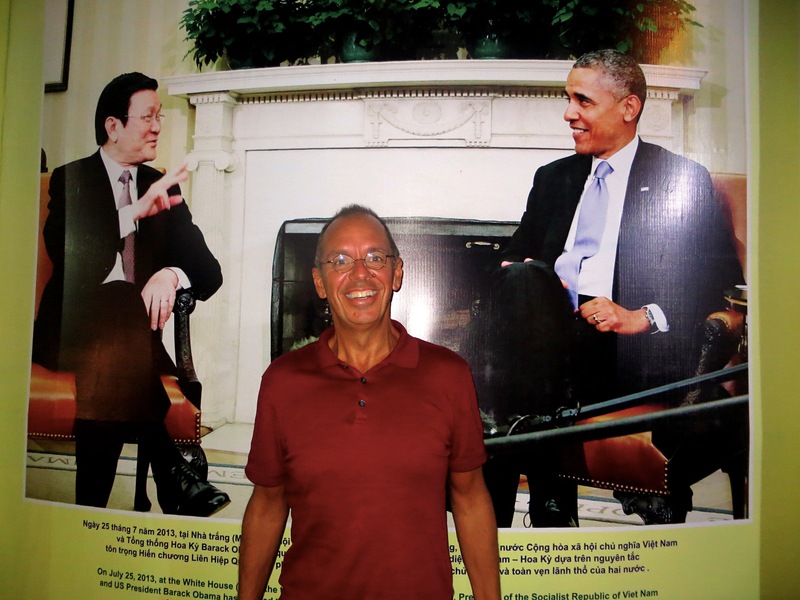 And then I was walking down the street and found President Obama chatting with Vietnamese President Truong Tan Song. OK, they weren’t really there, but there was a big poster of their 2013 meeting, suggesting the prestige that goes with a meeting between President Obama and … anyone. 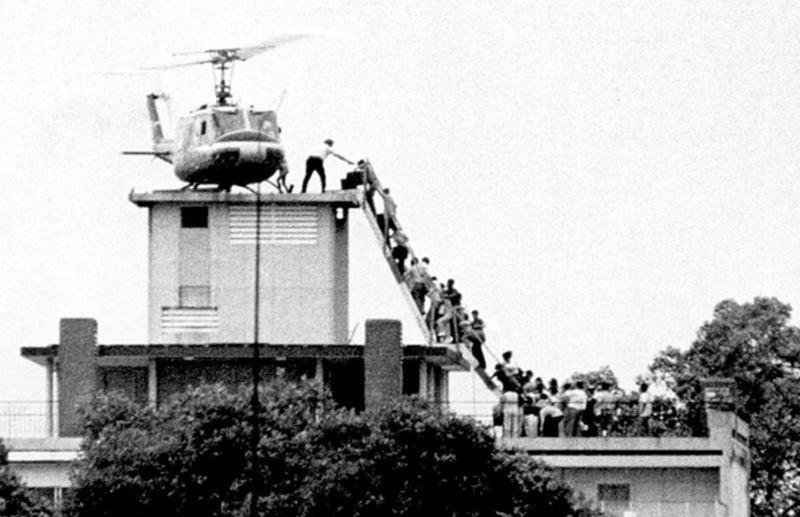 You’ll recall this iconic photo of the last Americans escaping Saigon on April 29, 1975, as the troops from the North moved in. 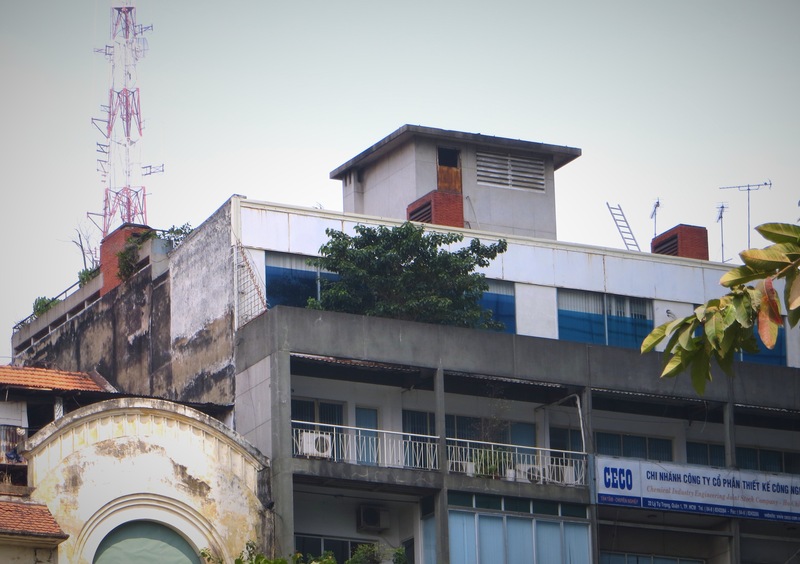 This is often described as people escaping from the Embassy, but in fact it was a building where many Americans – in particular CIA operatives – lived a few blocks from the embassy. A fitting example of how we got lots and lots of things wrong in Vietnam. Here’s the same building today, still standing almost 40 years later. Now it’s across the street from a beautiful little park, an upscale mall, and a high-rise office tower. I just couldn’t stop staring at that elevator shaft, once an emblem of America’s shame and defeat, now … just an elevator shaft. 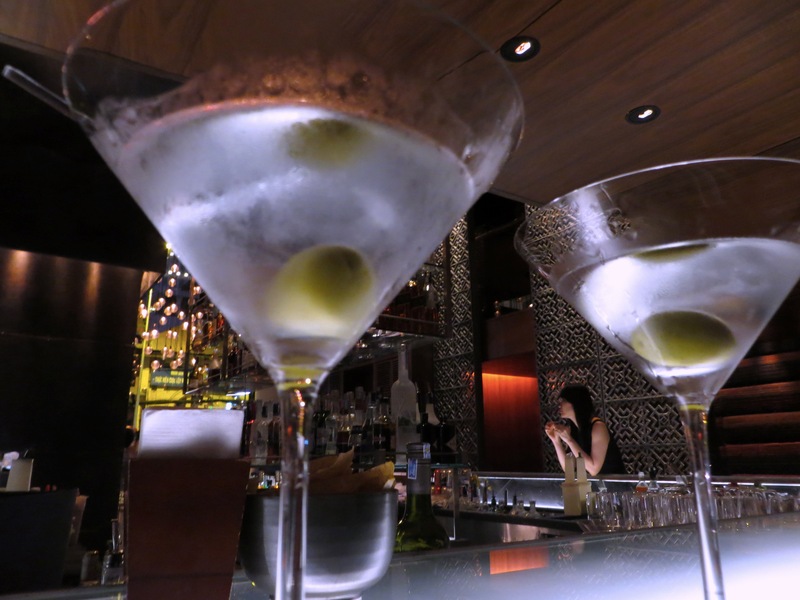 And finally, Tet martinis at the newly renovated Park Hyatt Saigon. Lovely. Gorgeous! Thanks for sharing the vivid beauty. I have to ask, though: the masks? How is the air quality? Sue – Our sense is that the people who wear face masks are just kind of weird; I just don’t understand it. This isn’t the Boundary Waters or anything, but the air here is pretty normal, nothing like Beijing or Mexico City or Bangkok.